A healthy immune system should maintain a balance between the ability to respond to infectious agents and tumor cells at the same time that sustains self-tolerance. For this purpose, the immune system must be capable of restraining foreign antigens, stopping the immune response after the resolution of a problem and blocking autoreactivity of immune cells that have escaped negative selection. For the maintenance of homeostasis and peripheral tolerance, a group of T lymphocytes named regulatory T (Treg) cells is produced from the CD4+ T cells in the thymus or in the periphery, where they have the ability to control the immune response. 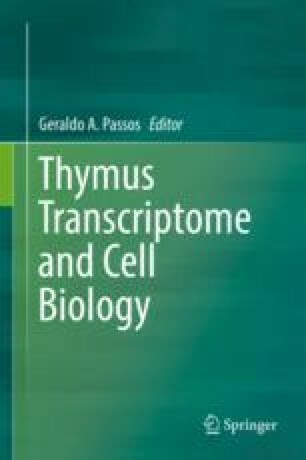 This chapter reviews the development of Treg cells within the thymus, detailing their markers and involved factors, including Foxp3 and other recently discovered transcription factors, as well as some noncoding RNAs. We ultimately discuss disorders associated with Treg cell deficiency and the modulation of thymic Treg cells to treat diseases. This work was financially supported by the Oswaldo Cruz Institute/Fiocruz, the Brazilian National Institute of Science and Technology on Neuroimmunomodulation/INCT-NIM, MERCOSUL Fund for Structural Convergence/FOCEM, the Brazilian Research Council/CNPq, Estacio de Sá University (Productivity in Research Program) and the Rio de Janeiro State Research Council (FAPERJ).